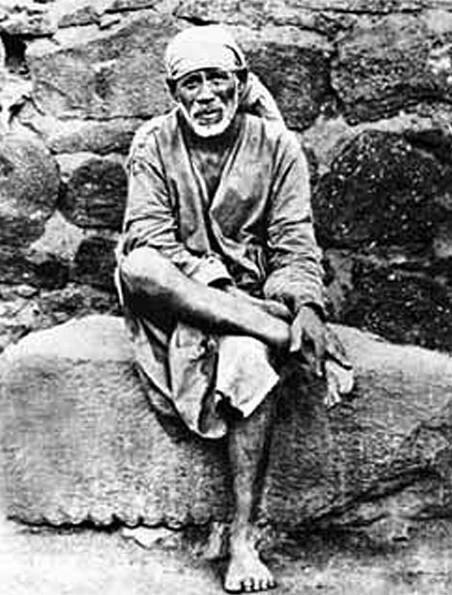 100 years ago, on 15th October 1918, Sai Baba of Shirdi left his physical body. He is a great siddha on the second ray, who is further manifested without being in a physical form. Through many examples and miracles he has demonstrated the constant connection with the omnipresent divine principle. His presence has influenced and transformed millions of people. In the book “Shirdi Sai Sayings” Sri Kumar gives central teachings of this great initiate. It is also available online. Below you will find two stories that Sri K. Parvathi Kumar told 20 years ago at a group life on Mount Rigi, Switzerland (retranslation from German). You all know Sai Baba from Shirdi. A great Master who lived in the early part of this century. He could command the elements. He could deliberately create fire, water and wind. He could spread, penetrate everything. How he spread, that also requires a story. There was a disciple who took care of a horse that Sai Baba had received as a gift. There are crazy disciples. A disciple gave Sai Baba a horse. What does he want to do with a horse? Imagine a person giving another one an elephant as a gift. Does he then give a gift or a problem? Often you get problems with gifts. So a disciple gave Sai Baba a horse. Sai Baba is someone who is always in contact with Cosmic Person. And immediately he understood that it is a fun that the Cosmic Person makes with him. So he did not reject the horse. He accepted the horse as if it came from Cosmic Person. That is the beauty of a master. Whatever comes to him, he accepts it with reverence, because for him there is nothing else but the Cosmic Person. So a disciple came to him with a beautiful Arabian white horse and gave it to the Master. The Master took it because it is the will of the Lord and daily he washed it and fed it and sought food to feed it. An activity for him and an activity he did with joy and without discomfort. He never cursed the disciple who had given him the horse. He understood that it was the will of the Cosmic Person that he had to take care of this horse. So the people who came to see him – every day many came to the Master to receive his blessings and find solutions to their life problems – and they saw him doing so much with the horse. He is not able to take care of the people who visit him; he has to take care of the horse. That’s how people see it. But the Master sees it differently. Be it a horse or a human being, he only cares about the Cosmic Person. Quite simple for him! So for him it is devotion to the Cosmic Person, be it the horse or a human being or something else. A disciple thought that he should help the Master to feed the horse. He went to the Master and said to him, “Master it is very painful for us to see how you have to work with the horse, that’s why I want to take care of it,” and Sai Baba understood that it is the will of the Cosmic Person. The Cosmic Person is happy about the devotion he has shown to the horse and that is why the Cosmic Person now wanted to free him from the horse. The views have different wavelengths; some have shorter wavelengths, others have longer wavelengths. And so he gave it to the disciple and said: “Please take care of it as I took care of it”. – “Of course I will, and I know how to take care of a horse.” This second sentence is additional. To say that one knows something with the emphasis on the word knowledge means one does not know. So Sai Baba looked at him from below, but said nothing, and the disciple took care of the horse. One day the horse was a bit angry and the disciple had enough and so he hit it once with the stick on the back. After having led the horse to the meadow and then back again in the evening, he came to the Master to touch his feet. And the Master pulled his feet back very quickly. The disciple asked: “What has happened, what have I done wrong?” – “There is something you must do on my back and not at my feet.” – “What happened to your back?” The Master said, “Go and look at it.” He had a thick stripe on his back. The disciple was very horrified and very angry: “Who is this fool who hit you like that?” Masters never answer in a way that would be hurtful. “Someone today has beaten my horse during the day and I have received it.” End; the disciple is on the ground. He didn’t say, “You did it, why did you hit the horse?” He just said, “Somebody did something to my horse and I received the slap.” And the disciple understood what had happened. He hit the horse and the injury was received by the Master. The horse is free of pain, although it also has the stripe. This is just to give you an idea of how the Master is everywhere. If anyone in the group gets hurt, then the Master who rules that group knows about it. Let’s get back to the story about giving. There was another disciple who regularly brought food to the Master. Shirdi Sai Baba lived in an open building. He did not want to live with others in their houses. But if he wanted to, he would go. He never needed an invitation. If he wanted to, he would invite himself to the other houses. The disciple who regularly brought food to the Master said every time he gave him food, “Master, when will you come to my house?” The Master never answered. After a few months the disciple said, “Tomorrow there will be a great sacrament in my house. Many are invited to receive food in my house. I would be very happy if you could come tomorrow and have lunch with us”. The Master said, “I will come!” – “At what time will you come, because we are used to making appointments.” The Master said at twelve noon. So the disciple did the sacrament and was about to serve food to the invited guests and he was looking for the Master. It was lunchtime now. The disciple did not find the Master, not even after an hour, and he was disappointed. He served all those who had been invited and he himself had taken nothing to eat. He was angry and this anger arose because of a disappointment. So he went to the Master at three o’clock. He looked at the Master and cried. “You said you wanted to come and you didn’t come. You disappointed me. We made an appointment and you disappointed me. I feel that I am not happy enough to receive Your grace”. It is for the disciple as if he received another insult to the injury. The disciple was surprised. And then the Master said, “I am as much here in this form that you see as I am in the dog. If you can’t see me in the dog, don’t come to me. If you can see me in all forms, then you are my disciple. Have this spirit of giving to everyone to whom you give something, because in everyone you give only to me”. The scriptures speak of this virtue of giving. But the best spirit of giving is when you always know when giving that you are giving it to the Cosmic Person, in whatever form. Such a spirit will establish you firmly in balance.